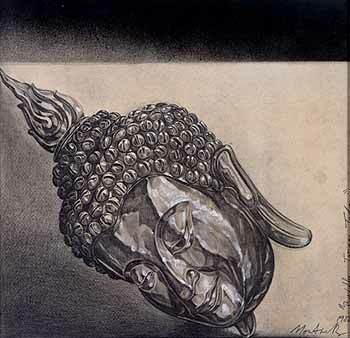 Buddha, 1982, mixed media on paper, 36 x 37 cm. Collection of Chongrux Chanthaworrasut, Bangkok. The first major retrospective exhibition of the work of Montien Boonma (1953-2000), one of the most celebrated Asian contemporary artists. This exhibition traces Boonma’s artistic development in the context of his deep engagement with Buddhism. Boonma’s striking installations, combining industrial materials such as steel and bricks and ephemeral materials such as spices and fragrances, explore the notion of artwork as spaces to experience the senses and contemplate the impermanence of human life and the physical world. Many of Boonma’s works are sculptural installations that must be built anew for each location where they are to be displayed. Every viewing environment, in addition, contributes a unique dynamic to each work. In order to highlight the accumulative and metamorphic nature of these installations, several of Boonma’s works are featured from preliminary sketches to photographs during the installation process to the final installation at the Asia Society Museum. Curated by Apinan Poshyananda, Professor of Contemporary Asian Art at Chulalongkorn University in Bangkok and a leading curator of international exhibitions of contemporary Asian art. This exhibition is the inaugural presentation of The Buddhism Project, a New York City-wide exploration of the many and varied relationships of Buddhism and the arts in contemporary American culture. Montien Boonma: Temple of the Mind is made possible with generous support from the National Endowment for the Arts, The Andy Warhol Foundation for the Visual Arts, Blakemore Foundation, the New York State Council on the Arts, and Tourism Authority of Thailand.